I put it off as long as I possibly could. I NEEDED that extra break each day. Moving usually meant puking, and my little pretoddler boy was a mover. The day finally came when I had to face the music so to speak. I had to drop my child’s morning nap. And what a glorious thing it was! Not only did it make it easier to fit in everything we wanted to in a day, but it made it so he took a longer afternoon nap. That meant a longer period of rest for me as a pregnant mamma, which was just what I needed. 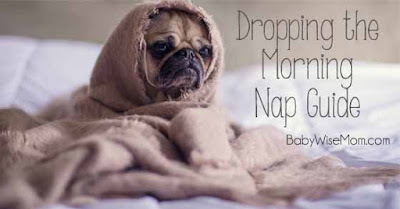 I have come to find that I always love moving to one nap a day. It seems scary, but it opens up life in a whole new way. You get the ENTIRE MORNING open to do things without your child needing to sleep. It often seems like an eternity since that was possible. So while it may scare you a bit, trust me that there are fantastic things that come with the one nap schedule. But how do you go about dropping the nap? And how do you know baby is ready to drop the nap? The age range for dropping the morning nap is pretty wide. Your child will be ready between 14-22 months. There are always outliers. There will be some 13 month olds ready and there will be some 23 month olds you are trying to convince to move to one nap. It really is almost always a 10 month old, though sometimes it is an 11 or 12 month old. I strongly recommend against dropping the morning nap before your child is one year old. Very strongly. Usually when people drop that nap too young, they create a sleep problem that spirals for months. If your child is 10 months old and seems like he needs to drop a nap, he is either experiencing a sleep regression, he needs a little more waketime before naps, he is teething, or he needs playtime to be more stimulating physically and/or mentally. If your child is 11-13 months old and seems like he needs to drop a nap, you are entering transition time. 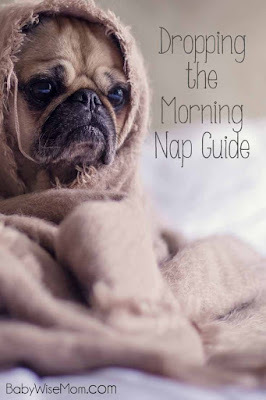 See my post Dropping the Morning Nap (from 2 to 1 naps): Transition Time. The morning nap goes well but the afternoon nap does not. He will not sleep well during that afternoon nap, if he sleeps at all. Your child is in the correct age range for dropping the nap. You have addressed the tricks for transition time and they are not working. Initially, your child might need the afternoon nap to start as early as 12 or 12:30. If your child can’t make it past that time, you are still living in transition time. Afternoon nap for one nap a day typically starts in the 1 PM hour somewhere, but the exact time will vary based on morning wakeup time and individual child sleep needs. The child who wakes at 7 AM will likely need nap at an earlier time than the child waking up at 8:30 AM. Cold Turkey: This is where you stop having a morning nap and you never look back. Again, you might start with a 12:30 nap start time but ultimately land at 1 PM after 2-4 weeks of being at one nap. Cold Turkey usually works best for the older toddlers who are dropping to one nap. If your child is 17 months or older, this is a good method for you to consider for dropping that nap. Weaning Process: In a weaning process, your pre-toddler takes two naps one day, and one nap the next. You might start with 5 days a week with two naps and two with one nap. Over time, you increase the number of days that are one nap. This works well for those younger children and children who are in transition time. It can be a difficult method because days are unpredictable, but it is effective. If you think your child might be ready for one nap, you can always give it a try. Try it for 2-3 days and reevaluate. Usually the first day will work out fine. If it continues to go fine, you are on the right path! If your child falls apart or can’t stay awake, you will need to go back to transition time mentality. I have had children with whom I was not completely confident they were ready to drop the nap and I had to just try it and see what happened. There is no reason to feel bad if you have to “try it” to know if it works. That is often what parenting is all about; try it out and see what happens! Changing sleep patterns isn’t usually easy even when it is something you are ready for. Just think of how hard it is for you to change by one hour at the time change–now imagine rearranging your sleep altogether. Even a child who is ready will likely be a little tired for the first week or so. It is wise to plan your days so you are doing things your child can’t fall asleep during. Be ready to entertain your child a lot during the first week or two. Initially, the one afternoon nap will most likely not be long. It will be 1.5-2 hours. As your child gets used to this new sleep pattern, your child will likely extend the nap to 2.5-4 hours long. The length will vary based on individual sleep needs and age. Expect the nap to lengthen out after 1-2 weeks. If it doesn’t then, I recommend re-accessing if your child is really ready for one nap or if the start time of nap is best for your child. Bedtime might need to be earlier, at least for a while. This nap dropping is not so much getting less sleep each day as rearranging the times the child is sleeping. If the one nap is short, you might need bedtime moved up by 30-60 minutes to make up for the lost sleep. This can move back as your child extends the nap length. Dropping this nap will be a delight to you once it is done. You can have a nice independent playtime in the morning about when that first nap used to be in order to take up some of that previous nap time. You can take trips to run errands with HOURS of time available. I promise, it is lovely. While I dreaded it with my oldest, I was giddy for it with my youngest. It is a great milestone! What Age Did Child Drop Morning Nap (went down to one nap a day)?